Not many people would argue that being a firefighter is easy. It's a tough job and firefighters probably don't get enough thanks on a day-to-day basis for being willing to risk their lives in the service of their community. A new map created by HowMuch.net shows the monetary gratitude firefighters receive around the country. The site used data from the Bureau of Labor Statistics to calculate the median firefighter salary in each state as of May 2017. Since it's a median figure, the state-wide figure glosses over the differences between, say, Philadelphia and a rural Pennsylvania town or states with larger gaps between the highest and lowest earning firefighters. Nonetheless, the map provides an interesting glance at the state-by-state differences. In some states, firefighters are well compensated, while the salaries are shockingly low in others. HowMuch.net attempted to explain the pay disparities between states a couple of different ways, including the political climate of each state and the regional demands of the job. Another notable variable is what the firefighters encounter in their job. 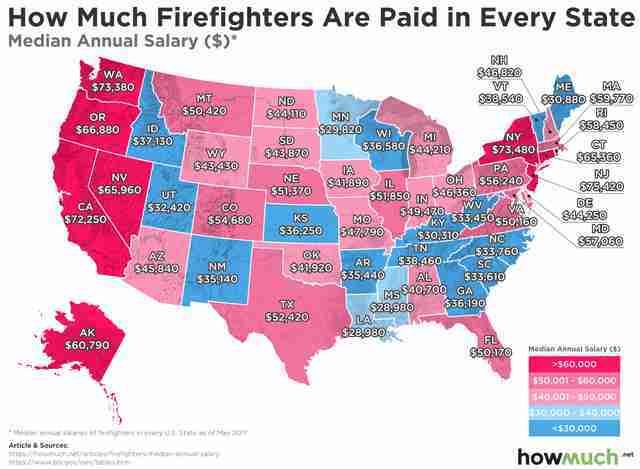 Western states like California, Washington, and Oregon have higher salaries, and that may be in part due to firefighters in those states having to deal with massive wildfires. 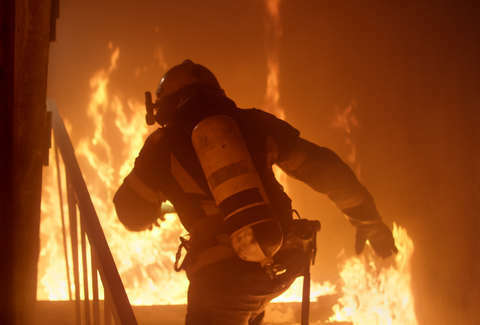 HowMuch.net also points out that firefighters play a key role in many cities as first responders, which can include responding to natural disasters or terrorist attacks. As a result, firefighters in large cities like New York may be able to demand higher salaries. Take a look at the map above to see how your state ranks.